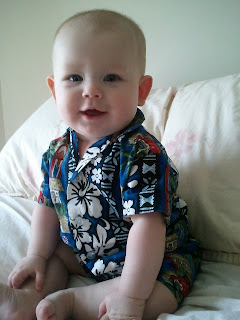 I took Cayne to his first ever Jimmy Buffett concert on Saturday night to kick off Memorial Day weekend. We left Ethan at home with Grandma and headed to the Margaritaville Nashville Street Party for music and drinks before grabbing dinner at Panera and then heading into Nashville's Bridgestone Arena for the show. Ethan wants to be a Parrot Head too! I had bought the cheapest seats in the highest section (section 314) because those were the only tickets available on Ticketmaster (I tried buying the second they became available online). 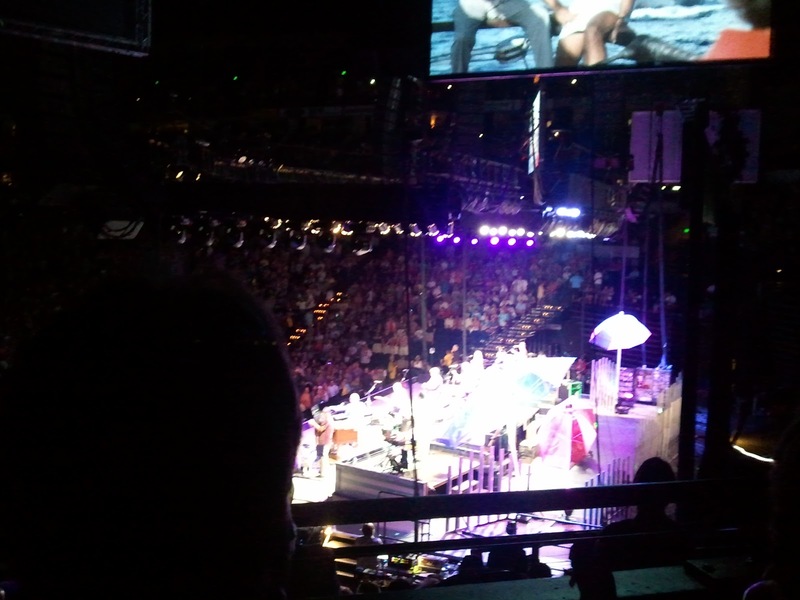 Unfortunately, they were "behind the stage" seats but I decided they couldn't be too bad...after all, the last time I saw Buffett in Nashville (my first Buffett concert) we were also behind the stage and still had fun. Well, I guess they didn't sell many seats in our section because when we got there, they told us they had closed our section and that they were going to exchange our tickets for the section immediately below it. So, we were still technically "behind the stage" although really we were "beside" the stage...right at the stage-left exit but we were moved much closer --- to section 108. We had to make our way all the way back down to the ground floor to get to our seats but it was definitely worth it! At his first Buffett concert. 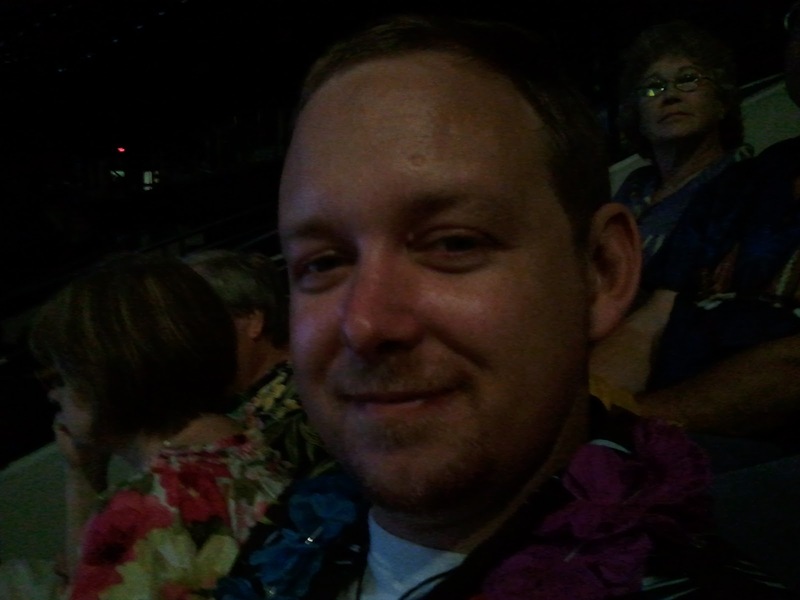 I'm not a big fan of Buffett concerts that take place in an arena because I think lawn seats are the best (and the most fun). And it seems that every time I'm in an arena, the section I'm in is full of people who do not want to stand and dance to the music, even if the whole rest of the arena is dancing. This concert was no exception but at least I had a great side-on view of Jimmy and the rest of the crowd having fun! Cayne thought it was funny to see someone set out Jimmy's jandals (flip flops) for him at the stage exit every time he left the stage. Kenny Chesney also came out a couple times to sing with Jimmy and Mac McAnally. Also, this was the first time I've ever seen Jimmy have an opening act but he did come out to introduce the group and they were fabulous! It was Ilo Ferreira and his band (and that link will take you to a story on the Bonaroo website describing how Ilo met Jimmy). They only played 3 songs but were really great and then the concert started. Jimmy also only took a brief one-song break (while Nadirah Shakoor sang). I still think it's pretty impressive that he can entertain for over 2 hours with such a short break! After the concert we were able to get out of the arena pretty fast since we were on ground level and made our way back to our car. A friend suggested parking between Church and Commerce Streets, which is what we did and we left Nashville via Church Street and didn't get stuck in any traffic. In all, it was a great experience. Cayne got to see that people really do were coconut bras and grass skirts to a Buffett show even if he didn't get to experience true Buffett tailgating with fins-on-cars and parking lot inflatable pool parties but he did get to see lots of parrotheads making the most of a no-tailgating situation. 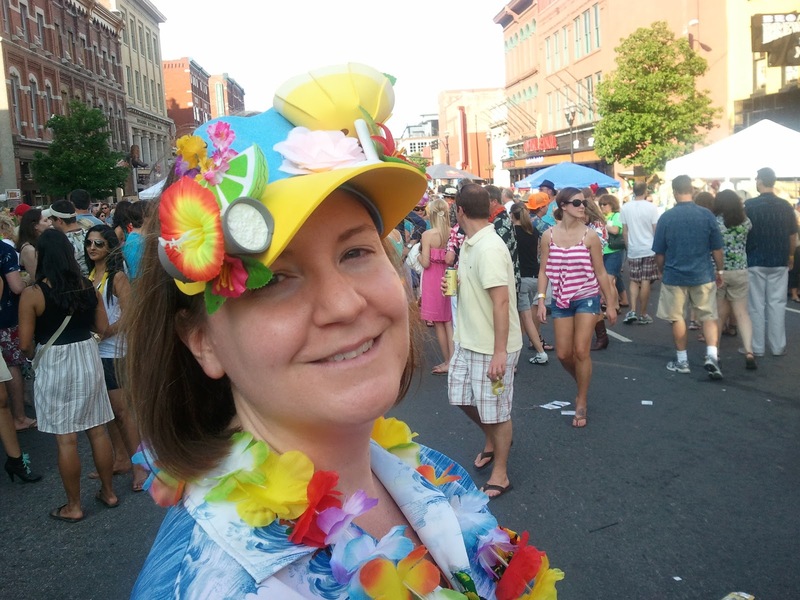 Kudos to Margaritaville Nashville for getting a permit to close down a block of Broadway for the Street Party...and for selling fabulous $6 margaritas (unlike Bridgestone, who sold worse-tasting margaritas for $12).